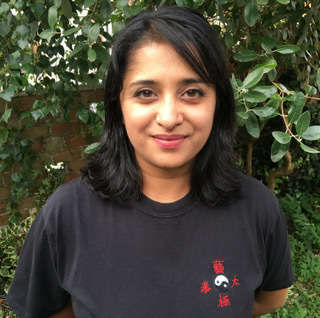 Manvinder Hutchings is highly experienced Senior Tai Ji instructor who started her Tai Ji Quan Yi (Yang Family) training in 1999 under the tutelage of David Miller SiFu, and still training under David Miller SiFu’s teaching. Manvinder has been actively involved in teaching the Art for several years, as well as supporting the organisation of Tai Ji workshops and residentials, as well as delivering presentations and group talks on the different aspects of Traditional Chinese Medicine (TCM) theory and acupuncture. This involves areas such as explaining and demonstrating the relationship between disciplines and the associated points that are applied to Tai Ji training enabling students to gain a deeper understanding of the complimentary healing components of Tai Ji and Acupuncture. Manvinder is regularly involved in public demonstrations of the Art to promote both the Art of Tai Ji Quan group as well as promoting an understanding to non-martial artists as to how Tai Ji improves one’s health. She also administers the Art of Tai Ji Quan website and co-ordinates its development and material with David Miller SiFu. Manvinder’s education began with a BSc Hons degree in Law and Business and followed her passion a few years later studied and gained her second degree in BSc Hons TCM, Acupuncture and Moxibustion after which she has been practicing Acupuncture in clinics covering Essex and Hertfordshire since 2008. Additionally she has experience treating patients in clinics in China and London including the NHS Gateway Multi Bed clinic offering low cost affordable acupuncture. The most eye opening experience for her was working in a hospital in Hangzhou, China. Gaining first hand experience in treating patients alongside with Medical Doctors, Chinese Herbalists and Tuina practitioners which influences the applied acupuncture techniques which Manvinder successfully uses to treat her patients to this day.